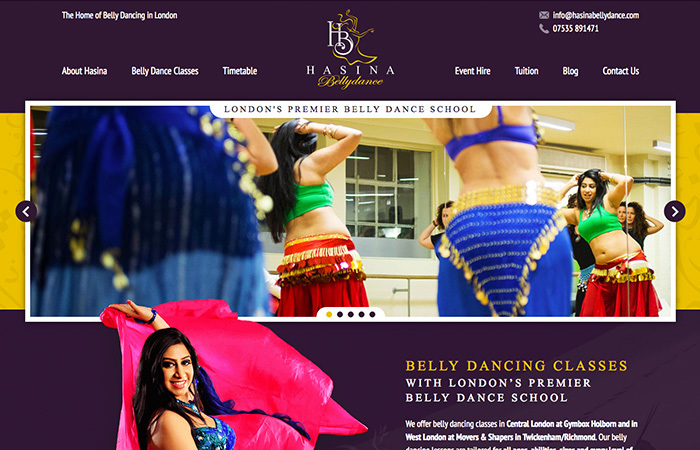 Hasina Bellydance needed a new logo and web design for the rebranding of their London-based dance company. Taking inspiration from the vibrant, colourful nature of what they do, the web design conveys an element of fun and movement, along with being in-keeping with the authenticity of their heritage. My aim was to give them an edge over their competitors with a striking and memorable web design, as well as the needing to work well on mobile, making it easy for Hasina’s clients to book their courses online. Tim is a profoundly gifted freelance web designer who displayed an unwavering commitment to my project. He exuded a strong work ethic and devoted a generous portion of his time to it. Teaming with Tim on my entrepreneurial journey is a reassuring place to be. A resounding well done on the success of my new high-end, luxury branding. Bravo Tim! My clients absolutely love it. Looking forward to our next venture!